Molly (EMMA GRIFFITHS MALIN), a vivacious young artist, and her three friends – Zoe (AMY NOBLE), Toby (GEORGE MAGUIRE) and Luke (REUBEN HENRY BIGGS) – embark upon a mission to find an empty house in London where they can live as squatters, free from rent and free to party. After finding what seems like the ideal place, they turn the house into their home. But darkness pervades their new dwelling and a malevolent force (JOHN R. REGAN) soon sets to work ridding the house of its unwanted residents. Spiderhole is your typical mishmash of horror elements and storylines. It borrows some from the Saw franchise, a little from the Hostel movies but removes any sort of background of the killer. The problem with this movie isn’t the mere fact it’s no different from any number of horror movies that have come before but that it doesn’t bother adding anything new or unique. Instead, we’re treated to four characters we don’t care about (and one is especially annoying) and a killer we know nothing about until the third act and even then it’s minimal and ultimately unsatisfactory. The cast is really nothing special, although I suppose Emma Malin probably stands out given she has the most screen time and makes the most out of a script that doesn’t offer a whole lot except to run around, scream, etc. The others are fairly forgettable and that includes the killer when we finally do get to see him. But on the whole, the cast I thought did their best with what they had. Before I get too critical, the main reason this movie gets the rating it does is that writer/director Daniel Simpson manages to provide a great and truly creepy atmosphere and what no doubt was a shoestring budget. Obviously creating a dark ambiance is nothing new in the horror genre, but here it seems natural rather than manufactured. Now onto my biggest gripe: the script and story just stinks, plain and simple. I can accept and even expect certain things to be in a torture horror film, it’s the nature of the beast. But when characters begin to inexplicably do dumb things, that’s hard to ignore and harder to forget. I can accept plot holes but stupidity is a different matter. The most glaring example (and I must provide a spoiler warning) is early on Molly and Luke are the only two standing and both are wielding hand-made weapons when they see the killer (wearing a white chemical outfit) walking down the hallway. The pair leaps out and proceeds to beat him to death. Of course, when they turn him over, they horrifically discover it was in fact Toby (after the killer had removed an eyeball). Obvious switch from the get-go, but whatever, its par for the course. However, near the end, Molly is about to make her escape. The killer’s leg falls through a deteriorating staircase leaving him immobile during which Molly gives him a good whack on the head, takes the keys and then tries to escape. Question: if she was so willing and blood-thirsty earlier, why not complete the job? Well, the killer is merely dazes and comes to just as Molly is about to make her escape (horror cliché #105). In any case, Spiderhole isn’t a terrible movie and at least has a great visual element but save for that, its 75-minutes of clichéd storytelling and a killer with a minimal and weak background. Interviews & Behind the Scenes (11:54) – The back cover is a bit misleading as it makes you think there are two different features but instead we get one featurette with both interviews and behind-the-scenes footage. 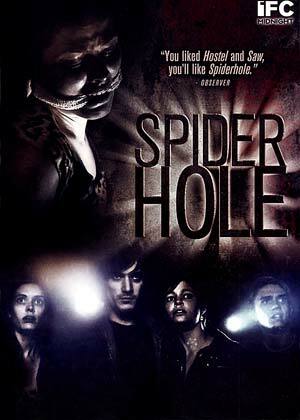 Spiderhole was filmed using the “RED” digital camera and is probably the biggest reason why the film looks as good as it does. Now, I did notice some interlacing here and there but on the whole, the black levels look good and artifacting/pixilation seems to be kept to a minimum. The Dolby Digital 5.1 track offers up a well rounded home theater experience showcasing the music used, dialogue spoken that mainly comes via the center channel and the numerous blood-curdling screams which encompass the other channels. The LFE channel does kick in every so often as well. Overall, writer-director Daniel Simpson’s Spiderhole offers up a great visual element but everything else is pretty much par for the course in horror and even then, it’s not that effective. However, I would’ve more than accepted the horror clichés if not for one character’s stupidity that makes little sense given what transpired earlier in the film. The DVD doesn’t have much to offer in terms of features but the audio and video are both solid and I guess if you’ve seen the movie already, it might be worth picking up.